RALEIGH – North Hills is about to get a lot bigger. Kane Realty, which developed the thriving North Hills community off of Six Forks Road, plans to buy or lease a total of 34 acres extending east toward Wake Forest Road. The move, along with a different developer’s plan for about 21 acres, would more than double North Hills’ footprint on the east side of Six Forks. Developer John Kane says he wants to create more offices, apartments and retail space along the Interstate 440 Beltline from St. Albans Drive near Wake Forest Road. His company, Kane Realty, filed a request this month asking the city to rezone the 34-acre wooded site. If approved, the company could build up to 1.3 million square feet of office space, 125,000 square feet of retail space, 2,100 residential units, 950 hotel rooms and 450 senior-living units. “We’re just continuing what we’ve been doing at North Hills for the last 15 years,” he said. Meanwhile, developers Todd Saieed and Ven Poole hope to bring a mix of office and residential space between Kane’s new property and the North Raleigh Hilton off of Wake Forest Road. Last spring, they asked the city to change the development code to allow up to 20 stories at the site. Saieed and Poole developed the nearby One Renaissance Centre, a six-story office tower built in 1999. There are no firm plans for the new development, but it will likely fit in with Kane’s plans, said Michael Birch, the developers’ attorney. “It’s very much an extension of what’s going on to the northwest in the North Hills area,” Birch said. Nearly two decades ago, Kane began transforming the run-down North Hills shopping center into a modern community of high-end retail, luxury apartments and office towers. He said he hoped all along to extend the development eastward. “We’ve been chasing this land for 15 years, but the owners haven’t been interested in selling until just recently,” Kane said. The development could transform St. Albans Drive, which hugs a residential neighborhood to the north. 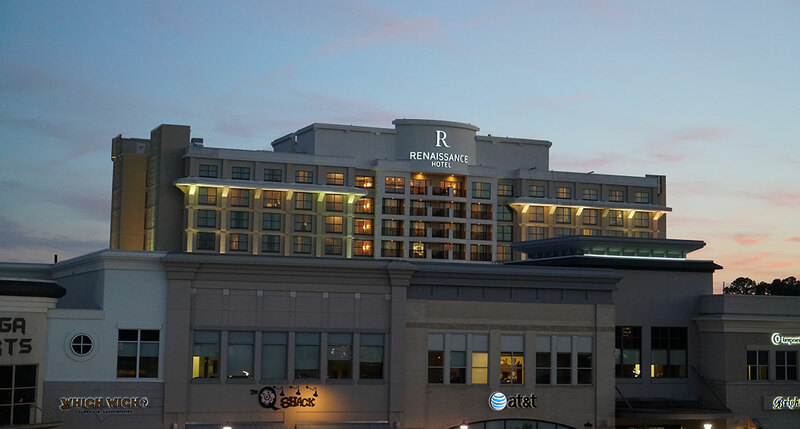 It could also bring changes to a stretch of Wake Forest Road near the Beltline, which already has Duke Raleigh Hospital, the Bahama Breeze restaurant and the North Raleigh Hilton, which Kane and his partners bought earlier this year for $41.9 million. His company wants to carve off a 1.6-acre corner of the hotel property closest to Wake Forest Road for new medical offices. Taller buildings would go near the Beltline, and apartments and other lower-density projects would go on St. Albans Drive. Kane said he plans to keep building as long as people want more apartments and businesses want more office space. Kane Realty is under contract to buy 20.2 acres for about $6 million in the area and secured a long-term lease for about 13 acres. About 7 or 8 acres can’t be developed because of electrical and sewer lines and a protected creek and tributaries, Kane said. It will likely become green space or a greenway. “We’re trying to green up along those tributary areas and make it an asset to the community,” Kane said. The plan to expand North Hills is in line with the city’s vision, said Travis Crane, assistant director of planning and zoning for Raleigh. In 2009, the City Council identified areas for dense growth, including Brier Creek, Triangle Town Center, Crabtree Valley Mall and North Hills. Since then, more than half of Raleigh’s new development has gone to the “growth centers,” Crane said. It could be years before St. Albans Drive and the Wake Forest Road corridor see big changes. In the meantime, Kane has early plans for more development near Six Forks Road. There are several potential development sites, including behind the Total Wine store off of Lassiter Mill Road and near the Capital Trust Building. Every year, an open lot there is used to sell Christmas trees. A 12-story building under construction is about 88 percent leased, and the Bank of America building is 75 percent leased, he said. As North Hills continues to grow, Kane says he hopes public transit will keep up. He supports the Wake Transit Plan, which would add bus service at least every 15 minutes along Lassiter Mill Road, Six Forks Road, St. Albans Drive and Wake Forest Road. “Hopefully there will be very good connectivity between downtown and the North Hills area,” he said.